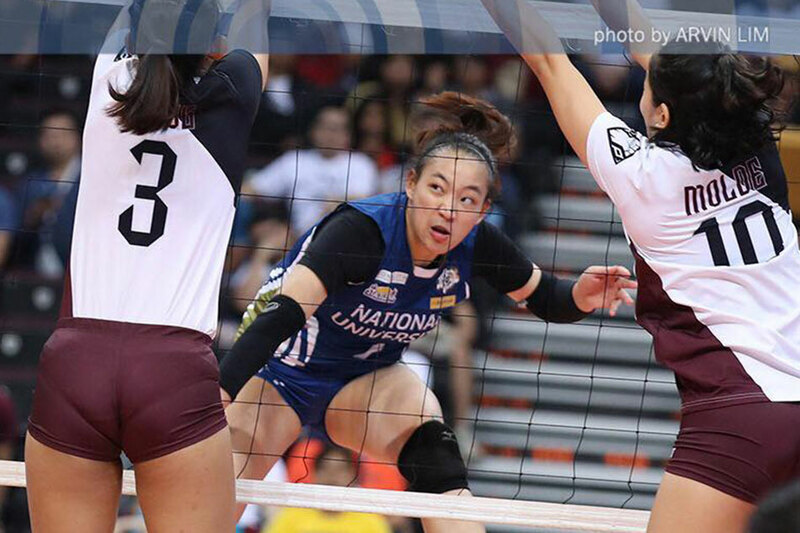 MANILA – (UPDATED) For the second time in UAAP Season 81, the National University Lady Bulldogs dealt University of the Philippines a crushing loss in the women’s volleyball tournament. National U officially booted the Lady Maroons from the Final 4 race with a scintillating 25-21, 26-24, 17-25, 23-25, 17-15 triumph on Sunday at the Mall of Asia Arena. With fans of Far Eastern University and University of Santo Tomas also cheering them on, the Lady Bulldogs displayed tremendous poise in crunch time to shock the Lady Maroons once more. NU had also beaten UP in five sets when they met in the first round last March 13. This time, the defeat was far more costly for UP, a preseason favorite to win the UAAP crown. The loss dropped them to 6-7, making it impossible for them to catch up to the Lady Tamaraws and the Golden Tigresses in the league standings. Thus, both FEU and UST are now through to the Final 4. “Pero siyempre, lalaban pa rin ang UP. But with this result, masaya ako kasi may lumabas na character sa team namin,” he added. Rookie ace Princess Robles was superb, scoring 20 points, while veteran Audrey Paran came through with 15 markers, including the match-winner. Skipper Roselyn Doria scored five of her 12 points off kill blocks, and libero Jennifer Nierva earned Player of the Game honors after tallying 30 digs and 27 receptions. The Lady Bulldogs showed great fight in claiming a two-set lead, rallying from an 8-12 deficit in the second frame to make it a back-and-forth contest. A running attack by Jessma Ramos put UP at set point, 24-23, but clutch hits from Robles and Paran put National U at the advantage. Gel Luceno then pounced on UP’s poor floor defense for the quick hit to end the set. With their backs against the wall, the Lady Maroons bounced back in the third frame, pouncing on NU’s 11 errors to seize a comfortable victory. They carried their momentum to the fourth set, wherein they pushed ahead, 24-20, off an Isa Molde hit. But UP faltered in the closing stretch, with Molde committing a service error before Rosie Rosier made back-to-back attack errors to keep National U in the hunt. Fortunately for the Lady Maroons, skipper Tots Carlos saved the day in Set 4 with a clutch kill that sent the match to a deciding frame. Neither team could gain momentum in the fifth frame, before the entry of service specialist Bingle Landicho allowed the Lady Bulldogs to gain some separation. After UP’s Marist Layug committed a service error, Landicho served an ace to push NU ahead, before back-to-back hitting errors by the Lady Maroons gave the Lady Bulldogs an 11-8 lead. UP forced an 11-all deadlock thanks to hits from Ramos and Carlos, along with a huge block by Rosier on Robles. But Robles bounced back quickly, scoring two consecutive hits to push NU ahead once more and force UP coach Godfrey Okumu to sue for time. What followed was a 4-1 UP run, with a kill by Carlos putting UP at match point, 15-14. Again, however, Robles came to the rescue, firing an attack off the UP blockers to extend the frame. UP shot itself in the foot when playmaker Ayel Estranero sent a pass at an awkward angle, preventing Molde from getting a shot off and once again putting NU at match point, 16-15. Paran then came through for her team in the final rally, scoring the match-winner that caught the UP defense off-guard. “Sabi lang namin, itong last two games na ‘to, kung manalo, manalo. Kung hindi, basta may best performance tayo,” he added. Carlos had 18 points to lead UP, but their other scorers faltered with Molde and Marian Buitre each tallying 9 points. Their second-leading scorer was Estranero, who had 11 points on top of her 24 excellent sets. In an exceedingly close match, UP had a slim 48-47 lead in attacks, but NU won in blocking, 10-9, and serving, 11-8. The Lady Bulldogs committed 45 errors to 40 for the Lady Maroons.